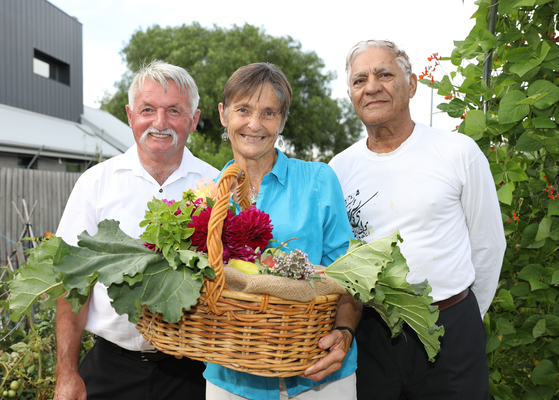 Keen gardeners like Mike Ostojic, Rosemary Nugent and Roy Pakzamar are reaping the rewards of their efforts at Geelong West Community Garden this summer. The garden was yielding a bountiful crop of fresh produce and social interaction, said nine-year member Rosemary. “I’ve got a cottage garden at home and don’t have enough room to grow vegies, so this is a great place to connect with the local community. Established in 1985, the community garden’s members now tend 34 plots, some half-sized. They also share facilities such as equipment sheds, fruit trees, a herb garden, a pizza oven and a sheltered area for workshops and meetings. Rosemary said members would conduct a working bee tomorrow to help maintain the gardens. The garden, in Autumn St, will host an open day from 6pm to 7pm on 18 February.